The recent news that someone found a dead bat in a packaged salad mix is pretty horrifying, but I admit a welcome relief from other current news in the world, such as Number 45’s latest temper tantrum tweet or a passenger being violently dragged off a United Airlines flight for no good reason. Also, I’m not missing news of April the Giraffe. Is she about to give birth? Any day now for two months. I wish her well but also wish the vets at the Animal Adventure Park in Harpursville, New York had more accurate information. So, for a while I get to ponder the bat issue. From both the bat’s perspective and imagining myself opening that bag. After interviewing a scientist who wrote a book and a blog about food safety, I usually stay away from pre-packaged salads. They are the most likely to be contaminated, she warned. But there are the occasional times I’ll grab a bag of greens, especially when I’m entertaining. I would NOT be a happy host if I got down my special salad bowl, poured out my lettuce and out plopped a flying rat. Or would it be folded inside, clinging to the cellophane? Actually, it was dead, partially decomposed, and the two people already munching away on the salad had to go for rabies testing. 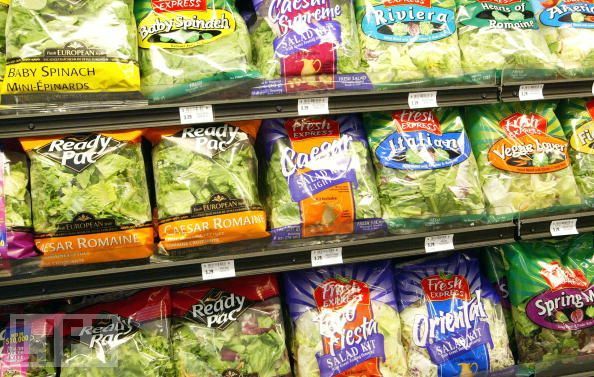 In another recent incident, a woman opened her salad package to find a LIVE scorpion still crawling around inside. I’ve only had two experiences like this in my life, neither as horrifying. When I was about 11, my mother showed me a box of oatmeal crawling with weevils. It took me YEARS to get over that. I still ate my oatmeal most mornings (my dad was Scottish) but I cringed with every speckled bite. Do you have any idea how many specs of dark color appear in oatmeal? My second experience involved a rice cake 20 years ago. You know, those faux crackers supposedly good for you made of sawdust and cardboard. In an effort to be virtuous and save time while out running errands, I bought a single, wrapped rice cake in a health food store. I opened it and took a bite. Then I noticed a black what looked like wire sticking out from the piece in my hand. I looked closer. A roach! A whole roach inside the rice cake. Since then, rice cakes have evolved into flavored and seasoned snacks, but there is NO WAY that attempt at sophistication has me fooled. Gag me. I will not eat you if you are the last food on earth. No wait, that’s roaches …. Such an affecting piece that I’ll never want salad again. 😉 (On a note related to youthful horror staying with us – I still can’t swim in the ocean without hearing the Jaws theme in my head)! Btw: You nailed it on the cardboard and sawdust rice cakes! not very appetizing, for sure! Previous Previous post: Should We Raise or Lower the Bar?